In the United Kingdom there are a large number of children and adolescents who are participating in sport. The government is currently spending over £450 million on improving the quality of the Physical Education and sport activities that pupils are offered . Leading to high numbers of participants in sport, not only inside of school but outside as well, 96.7% of children aged 11-16 and 84.1% of children aged 5-10 participated in sport outside of school . The young person with athletic potential is likely to have enhanced physiological and physical attributes compared to their peers  and can therefore be defined as a young athlete. Low back pain (LBP) occurs in approximately 10% to 15% of young athletes . Schmidt et al (2014) found that competitive adolescent athletes compared to aged matched individuals have increased prevalence of back pain. LBP is defined as pain localised between the 12th rib and inferior gluteal folds, occuring with or without leg pain . There are significant differences between the nature of LBP in adults and young athletes . The most common causes of LBP in young athletes are spondylolysis, spondylolisthesis, hyperlordosis syndrome (posterior element overuse syndrome) and discogenic pain. The growing spine introduces certain variables that predisposes the back of the young to specific injuries such as pars interarticularis injury; reported to occur in up to 47% of young athletes . It is of great importance for an athlete with persisting symptoms to undergo a thorough assessment . The impact of the structural problems is considered alongside other aspects such as psychological, social and cultural issues . This approach facilitates compliance with the rehabilitation process and promotes recovery , as there is evidence showing athletes with a prior back injury are 3 times more likely to develop LBP . The prevalence of low back pain varies between sports and, in some cases, the speciality of the position. Injuries encountered to the lower back in young athletes occur from either an acute traumatic event or repetitive trauma (overuse injury) and are commonly seen in individuals participating in sports such as football, rugby, gymnastics, ice skating and dancing. Evidence has shown LBP occurs is as much as 27% of college football players and between 50% and 86% of gymnasts. Overuse injury can be as a result of repeated flexion, extension and torsion which is performed frequently in gymnastics, ice skating and dancing. Table showing the causes of low back pain from 100 adolescent athletes with a chief complaint of low back pain and 100 adults presenting with acute back pain. The vertebrae undergo gradual growth and development over the childhood and adolescence. This causes distinct structural differences of the spine from the adult spine, which affects the nature of injury in young athletes. Development of the vertebral column occurs in three stages: mesenchymal, chondrification, and ossification. The three parts are united by hyaline cartilage. A cartilaginous ring develops around the anterior and lateral periphery of the centrum-disc interface, which firmly anchors the annulus to the centrum. The two halves of the arch ossify posteriorly by appositional growth . The centrum joins the arch during 3-6 years old . 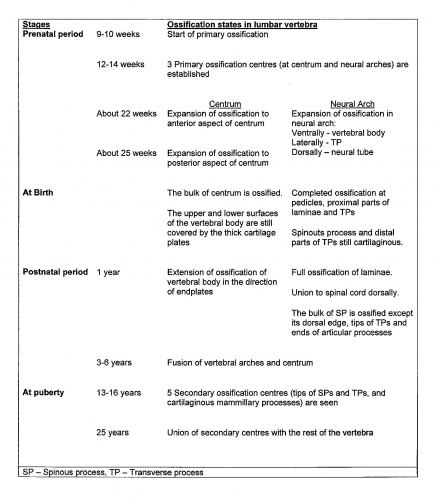 Around the age of 25, union of secondary ossification centres with the rest of the vertebra is completed . Adolescent spines are more prone to pars defects/fractures due to the incomplete bony maturation present in the neural arch . Biomechanical studies have indicated that the bone strength of the vertebrae especially the neural arch, can increase into the fourth or fifth decade of life . The physes may be vulnerable during development. Fusion between ring apophysis and the adjacent vertebral body does not complete fully prior to the age of 25 years. This increases the risk of apophyseal ring fractures in adolescents. A. The vertebral bodies, discs and growth plates (GP) of a 1-year old infant. B. The same structures in a pre-pubertal child. 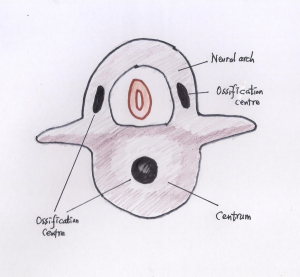 C. The appearance of the ring apophyses (RA) in adolescence. D. Ossification of the ring apophyses and the formation of the vertebral endplates (VEP) in adulthood. 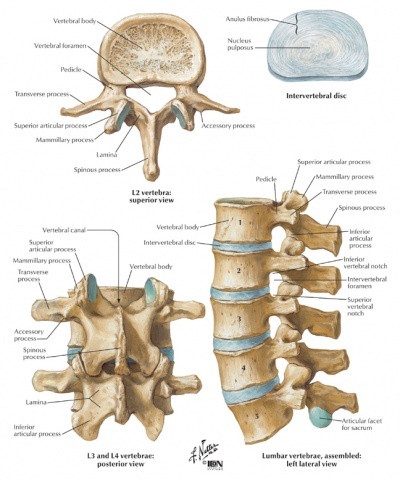 Figure - Anatomy of an adult lumbar vertebra, disc and spine. Compared with the adult spine, the nucleus pulposus in the spine of children has a relatively greater hydrophilic nature, allowing more effective force absorption and central distribution of force transfer to the adjacent vertebrae. Due to the combination of central distribution of force, via the nucleus pulposus, and a weaker vertebral endplate, Schmorl nodes occur more frequently in children and adolescents compared to adults. Schmorl nodes are vertebral end-plate herniations of disc material  . It was demonstrated that the vertebral end plate often fails before the disc in young spines, allowing herniation of the nucleus into the vertebral body creating Schmorl nodes rather than herniating into the spinal canal as in adults. The relative strength of the intervertebral disc compared with that of the adjacent bone may also account for the relative reduction in rates of discogenic injuries seen in adolescents compared with adults . The composition of the nucleus pulposus begins to change at 7-8 years old, resulting in a more peripheral force distribution of the disc. The incomplete bony maturation present in the neural arch contributes to the occurrence of pars fractures in adolescents. The physes may be vulnerable during development, increasing risk of apophyseal ring fractures in adolescents. The more central distribution of force by way of the nucleus pulposus combined with a relatively weak vertebral end plate may account for the relatively high frequency of end plate herniations of disc material (Schmorl nodes) that occur in children and adolescents. The relative strength of the intervertebral disc compared with that of the adjacent bone may also account for the relative reduction in rates of discogenic injuries seen in adolescents compared with adults. Risk factors can be divided into two groups; intrinsic (i.e. age) or extrinsic (i.e. weather) . The intrinsic factors such as age and gender act as predisposing factors to injuries, extrinsic factors act from the outside which could influence injury risk.It is the combined effect of both of these categories that can make the individual vulnerable to injury . 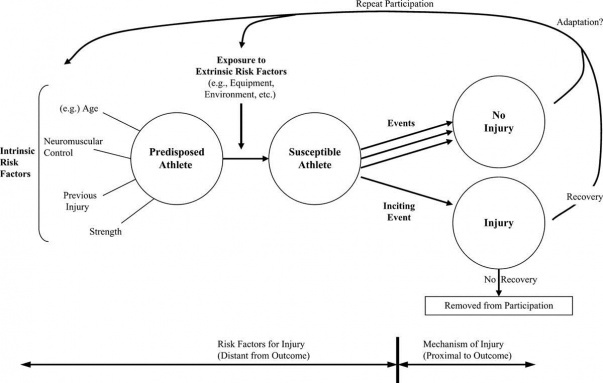 The effect of intrinsic and extrinsic factors in sporting injuries is illustrated in a model shown in figure 1 . It is the 'susceptible phase' of the model where the risks add together . During adolescence injuries of the low back are prevalent due to the spinal column changing in structure and flexibility, the changes take place in the vertebral bodies and neural arch  which are known as the growth ossification centres, one in the vertebral body and two in the vertebral arch . Epiphyseal growth plates surround either end of the vertebral body and ring apophyses attach to the outer anulus fibrosis. There are risks of injury associated with these structures including herniation of the intervertebral disc through the ring apophyses caused by repetitive flexion. Furthermore, injuries occurring to the ring apophyses can cause avulsion fractures . The vertebral arch consists of the facet joints, spinous process and pars interarticularis . 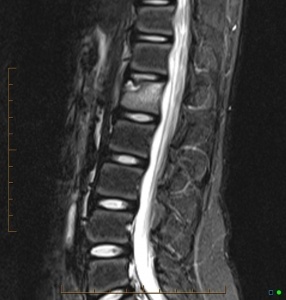 Failure in the fusion of these structures can lead to development problems, such as spina bifida occulta, which if present at the lumbosacral junction can increase the risk of spondylolysis. The lack of fusion can also lead to pars interarticularis fractures, which has been found to occur in 47% of young athletes . During periods of growth muscles struggle to lengthen as fast as bones grow. This can cause inflexibility and muscle imbalances predisposing them to injury. Growth and maturation rates can differ in children of the same age, resulting in differences in size, strength and skeletal maturity . The varied differences in size alongside other factors such as playing ability in young athletes can influence the impact of overload or excessive stress placed on spinal structures . Young athletes participate in intense training programmes with repetitive practice which increases the likelihood of injury  for example a gymnastic training programme can consist of up to 40 hours of training per week for elite gymnasts . This can cause overuse injuries and other musculoskeletal injuries . As part of training, a warm up is typically completed to reduce the risk of injury Lumbar flexibility is of importance for the lower back . Risk factors can be further categorised into modifiable and non modifiable factors, modifiable factors are of importance as there is the possibility of being able to change them, for example training to improve flexibility and strength. Non-modifiable factors are unchangeable but do influence the modifiable risk factors and therefore potential injury . Table 2 summarises the most common factors for injury during sport: categorised according into intrinsic factors (modifiable and non-modifiable) and extrinsic factors (modifiable and non-modifiable). The relationship between lower limb function and LBP has been investigated in college athletes and it showed athletes with reported LBP presented with a 5.8% greater difference between left and right extensor strength in the lower extremity compared with athletes without LBP. The study concluded that it is clinically relevant in terms of screening athletes as part of preparation for participating in sport to minimise the occurrence of LBP and lower extremity injuries. There is usually poorly localised lumbar pain without any associated neurologic symptoms. Specific area of pain and neurologic symptoms are more likely to show an underlying pathology. Knowing the onset of symptoms can help distinguish between acute or chronic overuse injury, and postural and developmental abnormalities. The clinical history of a patient should include an in depth description in order to hypothesize what could be causing the back pain. Red flags should be screened before carrying on with further assessment. An assessment for low back pain in young athletes is very similar to an assessment of low back pain in any individual. Mechanical symptoms Is the pain worse on movement? Does the pain cease during rest? Inflammatory symptoms Is there any morning stiffness? Does it get better with movement? Systemic symptoms Does the patient have a fever, night sweats or recent weight loss? Previous Treatments Has the patient had previous treatment for the same or similar condition? Lifestyle What sport they play? What position they play in? What time in the season is it? Does the pain have any effect on their psychosocial well-being? Does it interfere with school or interests? Past Medical History Does the patient suffer from any medical conditions such neurological disorders, scoliosis, malignancy, osteoporosis, chronic inflammatory joint disease or has any treatment of immunosuppressive agents? Has the patient had any previous injury or surgery? (Female) Have they had any problems with their menstrual history? Is there any of family history of orthopaedic, rheumatic or neurologic conditions? Observation begins as soon as you see the patient. The examiner should observe the patients gait and posture as they walk in and note down any abnormalities. To observe the patients posture in more detail it is best appreciated if the examiner is able to see specific bony land marks and areas on the patients back. It is best appreciated palpating the posterior spine with the patient in a standing position. Any point of severe tenderness should be related with the underlying soft tissue anatomy or bone. Useful places to palpate over, are the facet joints, spinous processes, paraspinal muscles, sacroiliac joints, posterior iliac crest, PSIS, gluteals, greater trochanters and ischial tuberosities. The examiner will ask the patient to bend forward and try to touch their toes with their knees straight (measure the distance from their fingertips to the floor). The examiner will ask the patient to bend as far backward as possible with knees straight, whilst supporting their lumbar spine (measure the degrees of movement). The examiner will ask the patient to bend as far to the side as possible, both left and right sides. (the patient should be able to touch their fibular head). As well as stabilising the pelvis, the examiner will place a hand on the opposite shoulder to prevent compensatory movements. They will ask the patient to rotate their trunk as far as possible (measure the degrees of movement). Tight hamstrings or asymmetry between hamstring lengths is common in patients complaining of low back pain. To examine a patients' hamstring flexibility the examiner will measure their popliteal angle. This is done with the patient in supine with their hips and knees flexed to 90 degrees. The examiner will then extend the patients' knee until there is a large resistance. The angle is measured between the femur and tibia at the joint line of the knee. An angle larger than 45 degrees may be a factor to having low back pain. The patients' back and hip range of movement should be measured passively and actively. By measuring the patients' popliteal angle it determines their hamstring flexibility. The patients core and lower limb strength should be examined. Lower limb strength can be measured using the MRC scale. A neurological exam should include trunk and lower limb sensation, strength, and deep tendon reflexes to investigate whether there is any neural involvement in the low back pain. Back pain can be referred from abdomen, pelvic or hip pathologies and injuries, so it is important to rule out all of these before carrying on with any treatment. It is necessary to perform laboratory tests to investigate patients with back pain and high suspicion of systemic disease or infection. If an infection is suspected CBC, ESR or CRP, blood and joint cultures should be screened. If arthritis is suspected rheumatoid factor, HLA-B27 and ANA can be investigated to help classification and decide treatment, but these results may not help diagnosis. If a hematological malignancy is suspected a peripheral blood smear (CBC) should be investigated. Radiographs can be used to detect fractured vertebrae and herniated discs. A bone scan detects regions of increased osteoblastic activity and can help locate specific areas of bone injury that may not be visible on radiographs. SPECT (singlephoton emission computed tomography) is useful in identifying stress fractures and spondylolysis. CTs provide a detailed image of bone and cartilage. A CT scan is useful for further investigation into lesions that are identified on a bone scan, including spondylolysis, fractures and tumors. Spondylolysis is a defect of the pars interarticularis at the posterior neural arch. It is thought to be a developmental or acquired stress fracture secondary to chronic low-grade trauma . Sponlylolysis is more frequently encountered by adolescents. There is a higher incidence particularly in those participating in certain sports or activities involving repetitive spinal extension and rotation e.g. dance, figure skating, gymnastics, and rowing . Among young athletes presenting with low back pain, spondylolysis is the most frequent diagnosis, occurring in up to 47%, and are postulated to be caused by incomplete bony maturation present in the neural arch . It involves mostly the lower lumbar region, which the incidence of lumbar spondylolysis in sports-engaged population has reached 63%. Bilateral spondylolysis at the same vertebral level can result in spondylolisthesis. Spondylolisthesis refers to the anterior displacement of a vertebral body compared with its alignment with the adjacent vertebral body . It was reported that about 80% of patients with spondylolyis demonstrated spondylolisthesis. During growth, the growth plate is the weakest link to anterior shear forces thus it is more prevalent to develop sponlylolisthesis . 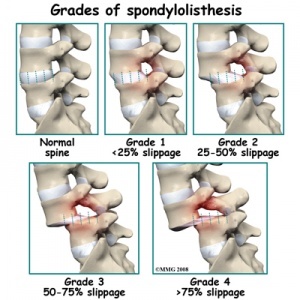 It is supported that there is not any increased risk of progression of spondylolisthesis with sports participation. When there is an increase in the anterior translation of one vertebral body on the other, it is usually correlated with growth spurt, and typically symptomless. Management should focus on avoidance of painful activities (extension movements), with the essential element of care being relative rest. However the ideal length of time resting from sport is unclear. An exercise programme should be initiated which focuses on strengthening the core muscles with the aim that this will stabilize the lower back and pelvis . Some practitioners recommend custom thoracolumbar orthoses or lumbar braces to limit spinal extension. Others advise restriction of activities without bracing. There is evidence for and against bracing in the management of spondylolyis therefore bracing a controversial issue among clinicians. Brace - the athlete wears the brace for four to eight weeks until he or she is pain-free. Activity is gradually increased until the athlete is participating fully in activities in the brace with no pain. Then the brace is weaned over the next couple of months. No Brace - athlete is usually restricted from activity for three to six months or until he or she is pain-free, and then activity is gradually increased until full activity is restored. The main effect of bracing, according to biomechanical studies, is for the brace to restrict gross movement as opposed to restricting intersegmental mobility. Camels and Fayolle-Minon compared brace vs no brace and concluded that there is no positive use of a brace in terms of bony union. Another study investigated the management of spondylolyis in young footballers and found that best results were obtained from a period of rest from sport for three months regardless of bracing. The best initial treatment is rest and ideally rest should include avoidance of any physical activity and sports. However the literature does not suggest specific duration of activity restriction, the consensus is based on the individual athlete’s clinical response and appearance of pars lesion on CT. Bracing is not uniformly supported by the literature. Spondylolysis rehabilitation can be started early and progressed depending on symptoms. Surgical intervention is rarely required, although a young athlete with a slip of 50% or greater surgical treatment is considered the best option. Posterior element overuse syndrome, also known as spondylogenic back pain, hyperlordotic back pain, mechanical low back pain and lumbar facet syndrome . It is a constellation of conditions involving the posterior spine, including muscle-tendon units, ligaments and facet joints . Posterior element overuse syndrome is the most common cause after spondylolysis of low back pain in adolescents . Allow pain-free activities but avoid extension of the spine. Use of anti-lordotic brace for short time support and protection. Repetitive spinal flexion and extension can injure the ring apophysis, resulting in fractures of the cartilaginous ring apophysis displacing posteriorly into the spinal canal, along with the intervertebral disc. Avulsion fractures occur in sports such as volleyball, gymnastics, wrestling and weightlifting . Low back pain secondary to disc disease is uncommon in adolescent athletes. Only 11% of young athletes with low back pain have acute disc herniation of the lumbar spine . Adolescents typically present with acute onset, flexion-related back pain with associated paraspinal muscle spasm, hamstring tightness and gluteal pain . Compared with the adult population, traditional radicular symptoms are not often initially present. A comprehensive physical and neurological examination is essential for athletes with presuming abnormalities. • Positive neural tension signs e.g. straight leg raise and seated slump test. • Possible decreased reflexes and strength on the affected side of the correlating myotomes. However, the presentation can be variable, with the patient having only axial low back pain until undergoing the provocative examination. Nonoperative care is advised as the dominant form of treatment for adolescent athletes who have discogenic pain . Overall, almost 90% of patients improve with conservative management . Scheuermann kyphosis is a developmental condition of uncertain cause affecting the thoracic or thoracolumbar spine. Scheuermann first described the thoracic kyphosis with three consecutive anterior vertebral bodies wedged at least 5% each, along with vertebral end plate changes, Schmorl’s nodes and apophyseal ring fractures . Although it generally occurs in the thoracic spine, a less common lumbar variant of Scheuermann kyphosis has been described with end-plate changes, Schmorl nodes, disc space narrowing and vertebral wedging, which occurs less frequently . The lumbar variant is seen more commonly in athletes participating in sports involving rapid flexion and extension or with heavy lifting. It is believed that this process may be a different clinical entity than it just being a variant of thoracic Scheuermann kyphosis . The literature suggests that Scheuermann Kyphosis has an incidence reported to be 0.4% to 8.3% in the general population and may be more frequent in males than females . Those diagnosed with Scheuermann Kyphosis tend to have a greater mean height than the overall population. Treatment depends on the extent of the symptoms and the degree of curvature. Patients with a curve of less than 50 to 60 typically respond well using flexibility and postural exercises in combination with relative rest, anti-inflammatory medication, or bracing. For more substantial curves of 50 to 75 in a skeletal immature patient, bracing should be considered. For those with curves greater than 75, bracing may no longer be effective and surgical treatment should be considered. A preseason screening programme can identify risk factors such as inflexibility, muscle weakness and previous injuries that are not fully recovered. These risk factors should be identified and addressed before the start of the season. Also athletes should start a general strength and fitness training program several weeks before the season begins, increasing the frequency and intensity of training gradually adapting towards the high demands of the sport. The training program, performance standards, and physical and psychological factors should be taken in to account. For a prevention training programme to be more successful in preventing injuries their needs to be detailed understanding of the training content, frequency, duration, recovery and athlete compliance. During periods of growth muscles struggle to lengthen as fast as bones grow. This can cause inflexibility and muscle imbalances predisposing them to injury . Due to this, young athletes should decrease the amount of training and repetitive movements during growth spurts. Stretching tight hip flexors and hamstrings can help reduce the risk of low back. Specific movements in certain sports, such as walk overs in gymnastics and lay back spins in ice skating, put high amounts of pressure on the posterior spine that may lead to injury. Athletes may need to reduce the amount of repetitions of these movements, especially if their pain is associated with these movements. Performing the correct techniques should be stressed to all athletes. Correcting posture to reduce excessive lordosis in the lumbar spine is important to help prevent injuries on the lumbar spine. Correct techniques must be used to prevent damage to the back in sports that require lifting, such weight lifting and dancing. It is important that athletes don’t associate back pain as being a part of their sport. Increasing complaints of pain should be addressed early and taken seriously to avoid significant injury, especially if the pain is interfering with activity. Back pain is associated with time lost playing sports among competitive athletes. It is reported that one fifth of injuries are severe which results in time away from sporting activity for up to 4 weeks and 20% of injuries are recurrences. The duration of the athletes treatment time off can be an indication of the severity of the injury and the sporting time lost can impact upon the sports person in several ways, such as mental well-being, therefore it is important that the athlete returns to sport as soon as possible. Return to sport following an injury is deemed appropriate after a period of rehabilitation for the specific condition which includes education regarding spinal awareness and dynamic postural control . A criterion for return to play consists of normal strength and pain-free range of motion . ↑ Department for Culture, Media and Sport, Department for Education. Getting more people playing sport, February 2013. ↑ Department for Culture Media and Sport. Taking Part 13/14 Annual Child Report. Statistic Release September 2014. ↑ d'Hemecourt PA, Gerbino PG, Micheli LJ. Back injuries in the young athlete.Clin Sports Med. 2000 Oct;19(4):663-79. ↑ Krismer M, van Tulder M. Strategies for prevention and management of musculoskeletal conditions. Low back pain (non-specific). Best Pract Res Clin Rheumatol. 2007; Feb;21(1):77-91. ↑ Greene HS, Cholewicki J, GallowayMT, Nguyen CV, Radebold A. A history of low back injury is a risk factor for recurrent back injuries in varsity athletes. Am J Sports Med.2001;29(6):795-800. ↑ 15.0 15.1 15.2 15.3 Bogduk N. Clinical Anatomy of the Lumbar Spine and Sacrum, 4th ed. Churchill Livingstone, 2005. ↑ 16.0 16.1 16.2 16.3 Pansky B. Review of Medical Embryology. Macmillan USA, 1982. ↑ 17.0 17.1 17.2 Schafer RC. Clinical Biomechanics: Musculoskeletal Actions and Reactions, 2nd ed. Williams & Wilkins, 1986. ↑ Williams PL, Warwick R. Gray’s Anatomy, 36th ed. Churchill Livingstone, Edinburgh, 1980. ↑ Cyron BM, Hutton WC. The fatigue strength of the lumbar neural arch in spondylolysis. J Bone Joint Surg Br 1978;60-B:234–8. ↑ 21.0 21.1 21.2 Clark P, Letts M. Trauma to the thoracic and lumbar spine in the adolescent. Can J Surg 2001;44(5):337–45. ↑ Netter FH. Atlas of Human Anatomy, 2nd ed. Icon Learning Systems, 1989. ↑ Ferguson RL. Thoracic and lumbar spinal trauma of the immature spine. In: Herkowitz HN, Garfin SR, Eismont FJ, et al, editors. Rothman-Simeone the spine. 5th edition. Philadelphia: Saunders; 2006. p. 603–12. ↑ Roaf R. A study of the mechanics of spinal injuries. J Bone Joint Surg [Br] 1960;42: 810-23. ↑ 26.0 26.1 26.2 Emery CA. Risk factors for injury in child and adolescentsport: a systematic review of the literature. Clin J Sport Med.2003;13(4): 256-68. ↑ Haus BM, Micheli LJ.Back pain in the pediatric and adolescent athlete.Clin Sports Med.2012; 31(3):423-40. ↑ 30.0 30.1 30.2 30.3 30.4 Theisen D, Malisoux L, Seil R, UrhausenA Injuries in Youth Sports: Epidemiology, Risk Factors and Prevention. Dtsch Z Sportmed2014; 65 248- 252. ↑ 31.0 31.1 31.2 31.3 Frisch A, Croisier JL, Urhausen A, Seil R, TheisenDInjuries, risk factors and prevention initiatives in youth sport. Br Med Bull2009; 92:95-121. ↑ Micheli LJ.Low back pain in the adolescent: differential diagnosis. Am J Sports Med.1979; 7(6):362-4. ↑ Cassas KJ and Cassettari-Wayhs, A. Childhood and Adolescent Sports-Related Overuse Injuries Am Fam Physician.2006; 73(6):1014-1022. ↑ Bahr R,Holme I. Risk factors for sports injuries--a methodological approach.Br J Sports Med.2003; 37(5):384-92. ↑ 37.0 37.1 37.2 37.3 37.4 Houghton, K. M. Review for the generalist: evaluation of low back pain in children and adolescents. Pediatr Rheumatol. 2010. 8(1), 28. ↑ Majlesi, Javid, Halit Togay, Halil Ünalan, and Sadk Toprak. "The sensitivity and specificity of the Slump and the Straight Leg Raising tests in patients with lumbar disc herniation." JCR: Journal of Clinical Rheumatology 14, no. 2 (2008): 87-91. ↑ Bhatia N, Chow G, Timon J and Watts G. Diagnostic modalities for the evaluation of pediatric back pain: a prospective study. Journal of Pediatric Orthopaedics. 2008. 28(2), 230-233. ↑ Rodriguez P., and Poussaint Y. Imaging of back pain in children. American Journal of Neuroradiology, 2010. 31(5), 787-802. ↑ Leone A, Cianfoni A, Cerase A, Magarelli N, Bonomo L. Lumbar spondylolysis: a review. Skeletal Radiol, 2011;40(6):683-700. ↑ 43.0 43.1 43.2 43.3 43.4 43.5 Zetaruk M. Lumbar spine injuries. In: Micheli LJ, Purcell LK, editors. The adolescent athlete. New York: Springer; 2007. p. 109–40. ↑ 44.0 44.1 44.2 44.3 44.4 d'Hemecourt PA, Gerbino PG II, Micheli LJ. Back injuries in the young athlete.Clin Sports Med; 2000:19:663–79. ↑ Farfan HF, Osteria V, Lamy C. The Mechanical Etiology of Spondylolysis and Spondylolisthesis. Clin Orthop Relat Res. 1976 Jun;(117):40-55.
sion of spondylolisthesis. J Pediatr Orthop 1996;16:364–9. ↑ King HA. Back pain in children. Orthop Clin North Am 1999;30:467–74. ↑ 54.0 54.1 Brown TD, Micheli LJ. Spinal injuries in children’s sports. In: Maffuli N, Chan KM, Macdonald R, et al, editors. Sports medicine for specific ages and abilities. London: Churchill Livingstone; 2001. p. 31–44. ↑ Rassi GE, Takemitsu M, Woratanarat P, et al. Lumbar spondylolysis in pediatric and adolescent soccer players. Am J Sports Med 2005;33:1688–93. ↑ Masci L, Pike J, Malara F, et al. Use of the one-legged hyperextension test and magnetic resonance imaging in the diagnosis of active spondylolysis. Br J Sports Med 2006;40:940–6. ↑ 63.0 63.1 63.2 63.3 Shah SW, Takemitsu M, Westerlund LE, et al. Pediatric kyphosis: Scheuermann’s disease and congenital deformity. In: Herkowitz HN, Garfin SR, Eismont FJ, et al, editors. Rothman-Simeone the spine. 5th edition. Philadelphia: Saunders; 2006. p. 565–85. ↑ 65.0 65.1 65.2 Simon L., Jih W., Buller JC. Back pain and injuries. Pediatric sports medicine for primary care. Philadelphia. Lippincott Williams and Wilkins. (2002) p. 306–25. ↑ Maffulli, Nicola, Umile Giuseppe Longo, Filippo Spiezia, and Vincenzo Denaro. "Sports injuries in young athletes: long-term outcome and prevention strategies." Phys Sportsmed 38, no. 2 (2010): 29-34. ↑ Feldman, Debbie Ehrmann, Ian Shrier, Michel Rossignol, and Lucien Abenhaim. "Risk factors for the development of low back pain in adolescence." American Journal of Epidemiology 154, no. 1 (2001): 30-36.